The glass and aluminium curtain wall is one of the principal elements of integration in modern high-rise construction. It satisfies two important criteria in such construction by providing a lightweight envelope and saving construction time. We provide the quality approved range of Aluminum Curtain Wall to our valuable clients. Dimension/Size: 1500 - 2000 sq.ft. 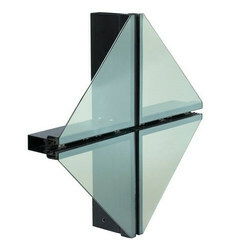 We are masters in providing Glass Curtain Wall Installation Service to customers. 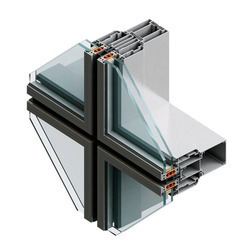 So as to meet the trends of market, we have been engrossed in offering Aluminium Curtain Wall. Aluminium show wall can be uniquely designed and can be installed in an excellent manner to the different types of buildings. Our adept team will ensure the quality and maximum strength to the structures without ant fail. In line with clients' diverse requirements, we are involved in providing an optimum quality range of Aluminium Curtain Wall. Supported ourselves with proficient amenities, we are readily instrumental in providing an inclusive variety of Aluminium Curtain Wall. Aluminium Curtain Wall Sections Anodized. Curtain Wall is a form of a vertical building enclosure which supports no load other than its own weight and the environmental forces which act upon it.